Many years ago now, there used to be a popular newsstand horror magazine called FEAR which, in the course of time, faded away with the onslaught of the electronic revolution in mass communications and information technology. It disappeared off the shelves, which was a great shame as it was one of the better periodicals out there. But, just like that other genre stalwart Starburst, it’s now made a welcome return to print, but this time backed up with an online presence as well. Anyway, the very first issue featured a review of Alison Littlewood’s The Eyes of Water and we have been promised that more reviews of Spectral publications will appear in the next issue plus, at some point, an interview with Simon Marshall-Jones. In the meantime, we reproduce here in full, courtesy of managing editor John Gilbert, the review of Alison’s chapbook. “Small or specialist publishers are the lifeblood of genre fiction and at the moment Spectral Press is one of its rising stars. So much have they to offer that we decided to feature [one] of their new […] titles. 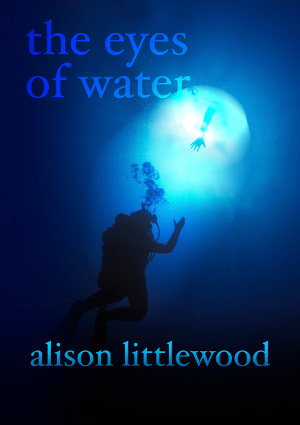 The first is The Eyes of Water by Alison Littlewood, a claustrophobic tale [of] underwater caves on the Yucatan peninsula of Mexico. Alex is told that his friend, Rick, has been found dead after diving into a cenote that fed into a whirlpool just off the coast. Alex finds Rick’s death hard to accept particularly as he was such an expert navigator of the underwater caverns. His suspicions are further aroused when he sees the body of his friend [in] the morgue and cannot understand as Rick’s face is the only part of his body to be destroyed in the accident. Drawn to investigate he soon finds himself [in] a world of danger he could hardly have imagined. Many thanks to John and the FEAR team for the review – looking forward to the other reviews when they appear! Onwards and upwards!